‘Clean Air in London’ (CCAL) has unearthed one of the biggest public health failings, or ‘cover-ups’, by a government in modern history – no estimate for the number of premature deaths due to long-term exposure to dangerous airborne particles. The cross-party Campaign for Clean Air in London (CCAL) congratulates Parliament’s powerful Environmental Audit Committee (EAC) on its hard-hitting inquiry and report into whether the UK has an effective strategy to comply with its air quality obligations. It is clear the UK does not have such a strategy. Volume II (containing oral and written evidence) will be available on the Committee’s website from 11.00am approximately on Tuesday 23 March. “The Environmental Audit Committee (EAC) must be congratulated on its hard hitting inquiry and report into air quality: ‘Early deaths from air pollution shame UK’. The EAC’s investigation has shown just how badly the UK has failed to develop an effective strategy to comply with its air quality obligations. The EAC’s inquiry has confirmed CCAL’s worst fears including its estimates for the number of premature deaths in London. 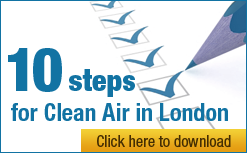 “The government should respond immediately by: giving Mayor Johnson full responsibility for complying in 2010 with limit values for dangerous airborne particles (PM10) in London; publishing its plans for complying with legal standards for nitrogen dioxide (NO2) and oxides of nitrogen (NOx); and communicating clearly estimates for the number of premature deaths due to poor air quality. “Why has it taken an inquiry by one of Parliament’s most powerful Select Committees (supported by an excellent report by the National Audit Office) to get a government Minister to refer, for the very first time, to the possibility of 35,000 premature deaths in the UK in a year due to air pollution? Why has the government never published an estimate for the number of premature deaths due to long-term exposure to dangerous airborne particles? “The highest government number we have heard before was ‘up to 24,000 deaths per year (nine times more than traffic fatalities)’ – which was repeated in a Ministerial speech on 17 September 2009. A Freedom of Information request by CCAL confirmed the ‘up to 24,000’ number used in the speech last year was based on 1998 estimates for the health impact of ‘short-term’ exposure to air pollution (which comprised 8,100 premature deaths due to dangerous airborne particles; 3,500 due to sulphur dioxide; and between 700 and 12,500 due to ozone). It is clear the government knew as early as 2001 that long-term exposure to dangerous airborne particles was responsible for many times more premature deaths than short-term exposure. “Under intense questioning as part of this EAC inquiry, Professor Frank Kelly – one of the UK’s most respected health experts – confirmed the likelihood of around 35,000 premature deaths in the UK in 2005 due to long-term exposure to dangerous airborne particles alone. Professor Kelly mentioned also a European estimate of some 50,000 for such deaths for the UK. Even allowing for some overlap between the number of premature deaths due to short- term and long-term exposure, and perhaps between different types of pollutants, it is clear the EAC inquiry has confirmed officially – for the first time – the full scale of the UK’s air quality problem. The EAC says people are dying up to nine years early in ‘hotspots’. “We should remember too that, even if the UK achieved clean air tomorrow, people would still continue to die prematurely due to their earlier exposure to dangerous airborne particles. Only over time, as a population generation lived its whole life free from air pollution, would people reach their full potential life expectancy. “It is very odd the government has never published an estimate for the number of premature deaths due to long-term exposure to dangerous airborne particles in the UK. The government’s omission is particularly odd given the European Commission, the European Environment Agency, the US’s Environmental Protection Agency and the World Health Organisation have all published such numbers in recent years as part of their communications to warn the public about the dangers of air pollution. “The Campaign for Clean Air in London is therefore repeating its call for the government to apologise for not warning the public, as it should have done, about the full extent of the health risks of poor air quality after its failure to publish, or its ‘covering-up’ of, an estimate for the number of premature deaths due to long-term exposure to dangerous airborne particles. Evidence heard by the EAC has confirmed the estimates provided by CCAL to the EAC last December including those of 3,460 and up to 7,900 premature deaths due to dangerous airborne particles in London in 2005 alone. The House of Commons Environmental Audit Committee (EAC) announced on 21 October 2009 its inquiry into Air Quality. The purpose of the inquiry was to assess whether the government is developing an effective strategy for meeting its obligations under the EU Air Quality Directives. Volume I of its new report into Air Quality is available on the Committee’s website. Volume II of the report will be available on the Committee’s website from 11.00am approximately on Tuesday 23 March 2010.